Very nice looking, Nikos! I like the blue one also. Super work. Clean, simple, elegant. I really like it. Excellent-looking calendar! Elegant and very stylish. Thank you for sharing! Didn't think of it as a "Glassy" calculator, but rather as it looked with your background picture, and I'm surprised to see how well it looks at both light and dark backgrounds. Excellent work! Very nice work! Its a great look, and I like it. adni you are maken some great widgets there clean useable and look great is there a chance of a glass clock and winamp remote like this? 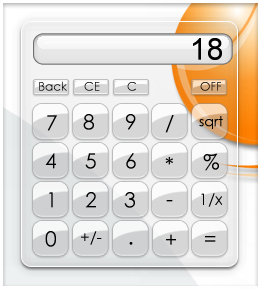 Is that possible that this widget could capture keystrokes, so that you can enter numbers from the numberpad, not only clicking the actual calculator-buttons? The calculator is very nice, I'd swap calc.exe to this, but I got used to type instead of click, and this won't change. Cool, thanks Adni. I'll check back later. So long, calc.exe, you were good, but not good enough. Say farewell to your fellow-applications before we go for a car ride and I come back home without you.